February 2, 2019 Emily V.
It’s been a full week since returning from SHOT and I finally feel like I can take a moment to decompress. It was busy during SHOT, as always, and all good things. However, I’m not gonna lie the struggle this week was real. Getting back to work, then trying to get things organized with SMT, and getting the new podcast episodes ready to go-live…phew. A lot of things happening but I wouldn’t have it any other way. Unfortunately, this was the first year that I didn’t get a lot of time to roam the floor and booths. I had a list of things I wanted to see and check out but I barely made it to a quarter of them. This was my first year being able to attend SIG Sauer’s Premier Media Range Day. Last year I missed out because I couldn’t make it to SHOT until after. But I’m so glad I was able to make it to this invite-only event this year. It’s where they unveil all their new products. It’s a really fun event but mostly I like how intimate it was. No insanely crowded booths or lines like Industry Day. I felt I got to shoot a good variety of guns. Of course, my favorites are always the rifles. Mainly because I’m a much better shot, it’s more fun, and I don’t get to shoot them that often. It was the one year anniversary since Amy and I first launched our podcast, Not Your Average Gun Girls. It was during last SHOT Show that we recorded our very first episodes. I remember being so freakin’ nervous, not knowing what to expect, utterly hating the way my voice sounded, and hoping that someone other than my husband would listen to it. Well a year later, I love doing the podcast, I’ve gotten semi-used to my manly voice, and am so sincerely thankful that you all listen and not only listen, but support it, find value in it, and love it. And we’ve got some big plans coming for it. Our goal has always been to bring women of this community together so we wanted do a little meet-up during SHOT. Just a fun happy hour where people could come and go as they please but mainly so women could meet and connect with other women in industry. We had an amazing turn out but what was even more gratifying than the amount of people that showed up was the messages received after. So many women were able to meet other women in this industry that you wouldn’t have been able to or have always wanted to meet in real-life. I think some really great connections were made and I know that Amy and I are so grateful to be able to support and help bring this community together. Watch the little video on the right of our event and week of podcasting. Obviously on top of the meet-up the main priority was to get some episodes recorded while at SHOT. We definitely accomplished that. We’ve already released four episodes (listen here) and the rest of the SHOT Show interviews will be released throughout February. Huge thanks to our sponsors: SIG Sauer, Aguila Ammunition, Full Conceal, StealthGear USA, Heckler & Koch, and Elite Tactical Systems for letting us invade their space. Additionally, even bigger thanks to all our guests that took time out of their busy SHOT Show schedule to come hang out with us. We truly love being able to hang out with all our guests in person. When I tell you there are so many events and parties to attend, I’m not kidding. Each night there are probably 10 different events going on (probably more). You can’t possible go to all of them and honestly, I don’t want to go to a lot of them. I’ve done the Crye, Glock, Salient, etc. parties in years past. I feel there are kind of like a been there, done that thing for me. I would much rather hang out with the friends I don’t get see that often grabbing dinner or lounging at a bar. However, there are definitely a few events that were a not miss for me. The Gift of Gun event organized by Tracy Lee (@tracyguns) held at The Range 702 was awesome. This was an influencer heavy event that was open to the public. The purpose really was to connect influencers in the industry with brands for a potentially mutually beneficial relationship. Plus, there was opportunity to shoot some guns. Who can pass that up?! I am truly thankful to Tracy for inviting me as an influencer. I had the opportunity to meet so many people as well as some brands. Unfortunately, a lot of the brands were offering great items in their gift bag that I can’t legally possess in DC. You know, like 100 round drum magazines. I totally would’ve been down with having one. It would be fun at the range. But I can live vicariously through my friends who get to have all the fun toys. A special shout out to Tracy for organizing this. The event was packed and I know she put in a lot of hard work to make it happen. Also, I do want to give a shout out to all the sponsors that provided cool gear that you should check out. You might find something you like. You can also check out some additional photos from the event here. The NRA Women’s Breakfast on the Go might be the perfect networking event. It’s was held at 7 am, which yes, is super early for Vegas but it’s nice because it’s not held in a dark or loud bar. You can actually have an opportunity to talk to a lot of different women attending SHOT and do some great networking. It’s one of those easy events where you will definitely see some of your friends you only get to during trade shows like this. Plus, I got to be reunited with two women I admire and respect so much in this industry that also happen to be part of the Love At First Shot Season 5 family (Hi, Julie and Becky). As I mentioned, there wasn’t much time left in between meetings and podcasting during the day to browse many booths. I definitely had to stop to check out the new Mossberg MC1sc. The MC1 is their new subcompact 9mm which is made for concealed carry. It felt nice in my hands and from what I’ve heard so far people are liking the way it shoots. 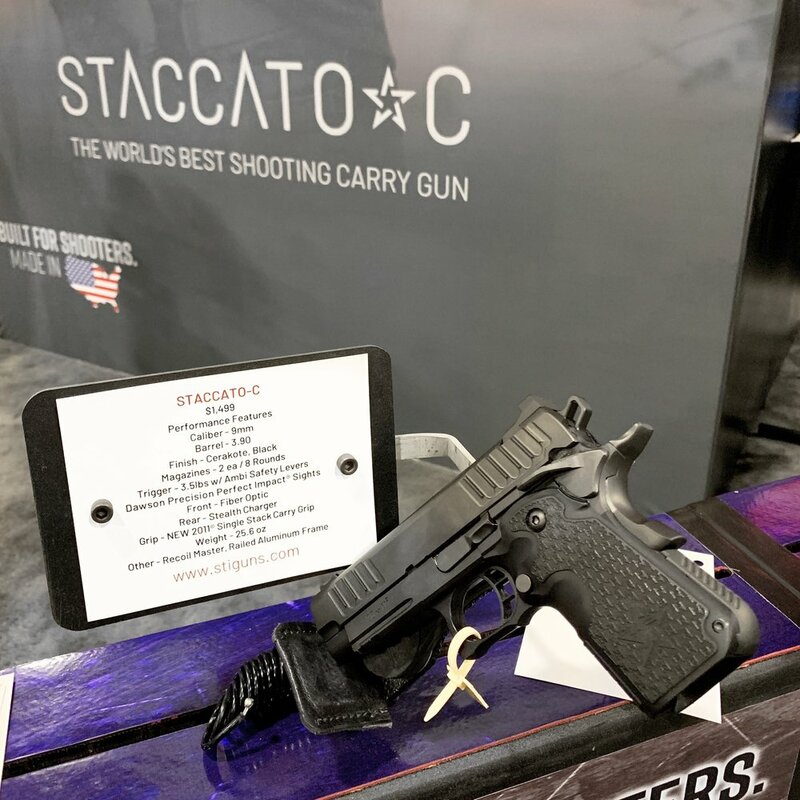 I also got a great preview of STI’s new Staccato C. You might recognize their name from the competition world but with this line they are offering a defense pistol that also would be a good option for concealed carry. Be sure to check out my SHOT Show Instagram highlights to learn more about the STI Staccato C from Becky Yackley. 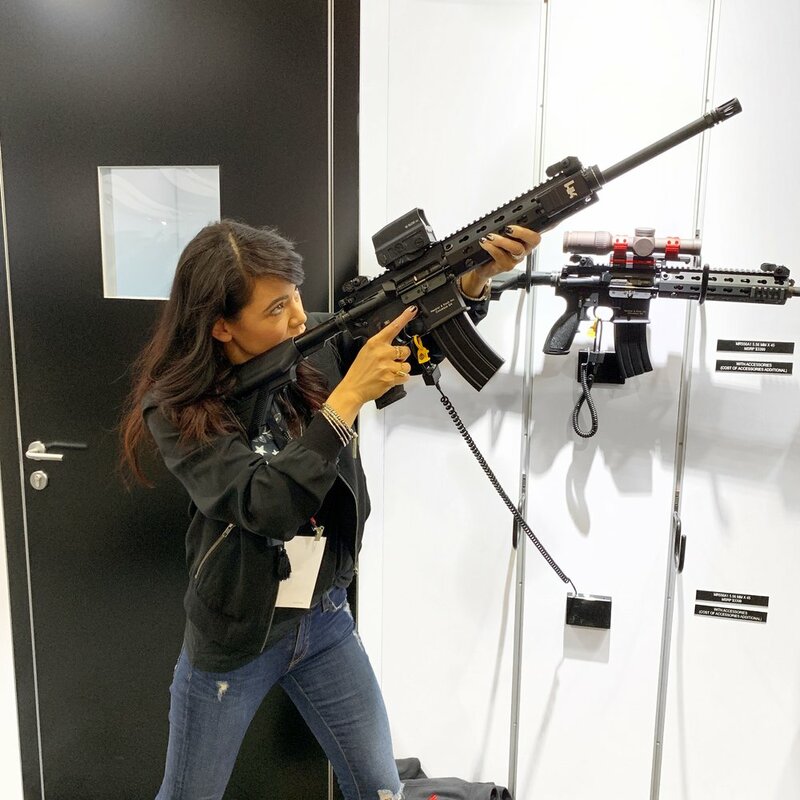 I did swing by my favorite safe company, Vaultek to check out their new rifle safe and also fell in love with this white one. 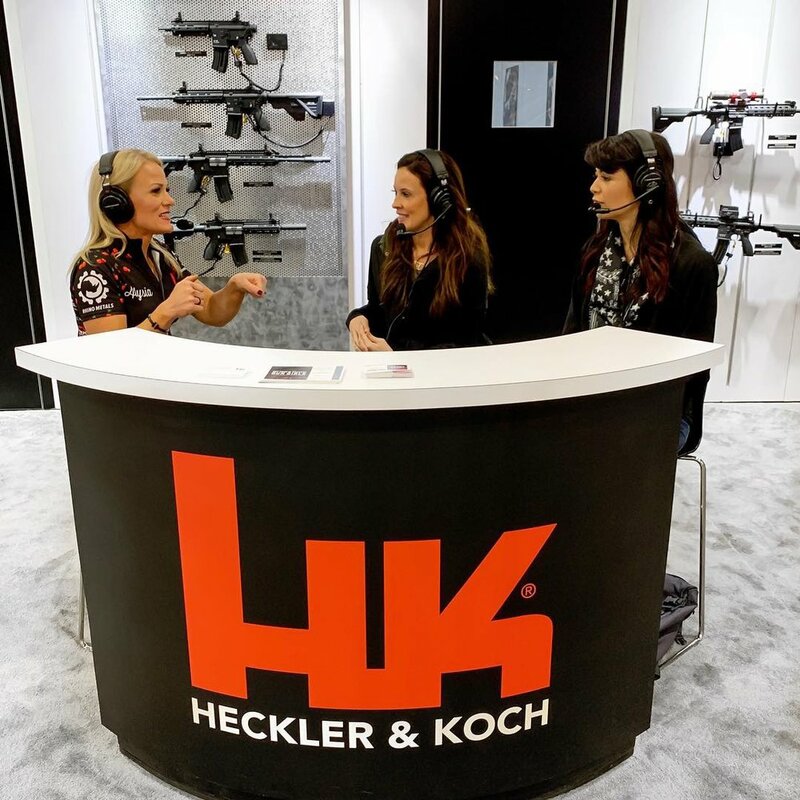 And, as always, I made time while podcasting to scope out a few favorites from Heckler and Koch. My wish list SP5k and the new VP9 long slide (check out this great video from Sean to learn more about the HK VP9L).